One of the best things about working at Europa Sports is that everyone is always talking about nutrition and fitness. As I was walking down the hallway the other day, I heard someone say: “I need to cut back on the fat that I’m taking in, if I want to lose weight.” This isn’t completely accurate. Fat actually helps with losing (and maintaining) weight. It all depends on the the type of fat. There are good fats and bad fats. Let’s discuss. Did the low-fat diet craze contribute to America’s obesity problem? A few years ago, the “low fat/no fat diet” trend swept across America. The food manufacturers marketed their products as “low fat” and “fat free.” The general public responded with open mouths. It was healthy, right? Wrong. All wrong! When these manufactures took out the fat, they put in a ton of sugar and salt to add flavor and improve the taste. What happened? America gained weight. What role does fat play in your diet and body? You do not want to avoid fats all together. Fat is an important nutrient essential for normal growth and development. It provides energy, protects our organs, helps maintain cell membranes, plus helps the body absorb nutrients. Do you know how testosterone is made? It’s made from cholesterol, a type of fat. 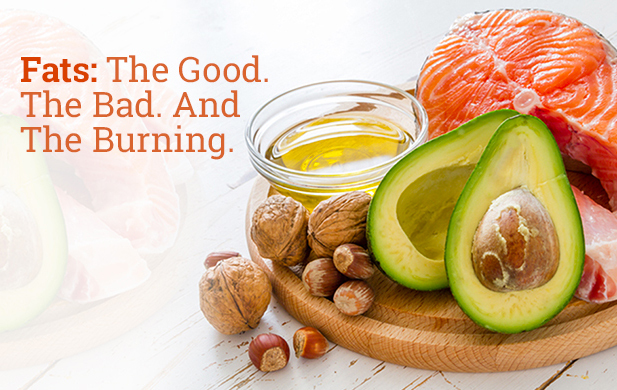 Good fats even help the body burn bad fat. When creating weight loss plans, some nutritionists recommend that approximately one-third of your calories come from fat—the good kind. Cold water fish: salmon, sardines, trout and tuna. Almond butter (natural and low in salt and sugar). Oils: olive oil and canola oil, which delivers 8 times the amount of omega-3 per serving as olive oil, and coconut oil which is saturated but does not contain the cholesterol. Unsaturated fats can help you burn fat without cutting calories. A 2009 study from the British Journal of Nutrition found that participants who consumed the most unsaturated fatty acids had lower body mass indexes and the least amount of abdominal fat compared to those who consumed the least amount of unsaturated fat. Why? The unsaturated group ate higher quality foods. Unsaturated fats are a much higher source of nutrient dense foods. It has been well-documented that omega-3 fatty acids have an anti-inflammatory effect. When you reduce inflammation in the body, your overall health is improved and it helps from an athletic performance standpoint, too. Fun fact: Almond Butter has 50% more monounsaturated fats than regular peanut butter, however twice to three times the cost! But it’s worth it. Helpful hint: Pack some walnuts or a handful of almonds in your lunch each day. Or make a natural almond or peanut butter sandwich on a slice of whole wheat bread for a mid-morning or mid-afternoon snack—like I’m getting ready to do right now!